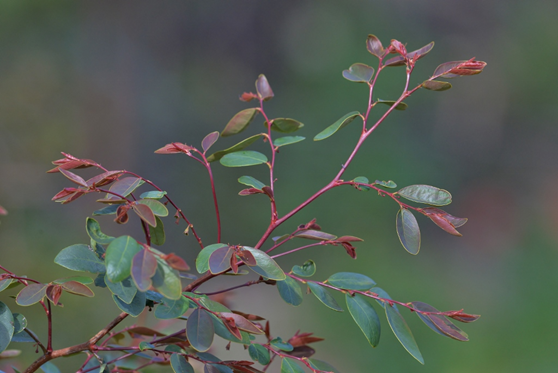 This small to medium open shrub to 2–3 m is found naturally along the edge of our local rainforests and in moist gullies in eucalypt woodland. It is an important butterfly host plant for the common grass yellow butterfly Eurema hecabe (so it is preferable not to spray the plants if the leaves are being eaten by the small green caterpillars, which, in turn, are relished by birds). The Coffee Bush has glossy elliptical alternate leaves (as if stepped along the branches), which are paler underneath. It has flushes of striking red new growth after rain. The inconspicuous flowers are borne on the underside of the branchlets between the leaf axils. These are followed by pale greenish round berries that turn reddish or black when ripe. This is a hardy, attractive shrub that will tolerate most soils. It grows best in full sun or semi shade and benefits from mulching and occasional pruning. It is a useful foliage plant for any sized garden and could be used as a hedge. A closely related dark-leaved species Breynia cernua ‘Ironstone Range’ is widely available in nurseries, but it originates from northern Australia. Specimens of the local species can be seen at the Samford EcoCorridor (https://www.facebook.com/EcoCorridor). Have often wondered what this little gem is. Thanks, Peter.